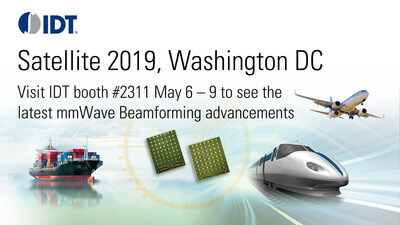 IDT to Showcase Latest Satcom Phased-Array Beamforming Solutions at Satellite 2019 | Integrated Device Technology, Inc.
IDT is a leader in the development of circuit-level RF innovations and a trusted supplier to leading communications systems providers. Using the Smart Silicon™ approach to combine optimal process technologies with these innovations delivers a portfolio of differentiated RF products. To learn more about IDT's RF technology, visit idt.com/rf. © 2019, Integrated Device Technology, Inc. IDT, Smart Silicon, and the IDT logo are trademarks or registered trademarks of Integrated Device Technology, Inc., and its worldwide subsidiaries. All other brands, product names and marks are or may be trademarks or registered trademarks used to identify products or services of their respective owners.